The Hokkaido Prefecture consists of the island of Hokkaido and several smaller islands, such as Rishiri, Okushiri Island and Rebun. The Japanese government also consider several of the Kuril Islands a part of this prefecture, but there is an ongoing conflict with Russia about this. Hokkaido is the second largest Japanese island, and the Hokkaido Prefecture is the country’s largest and northernmost prefecture. Historically, this island has been known as Ezo or Yezo. Located in the south-western part of the Hokkaido island, Sapporo is both the most populated city on the island (almost 2 million people live here) and the capital of the prefecture. Two other important cities on the island are Hakodate in the south and Asahikawa in the central region. Honshu, the largest Japanese island, is separated from Hokkaido by the Tsugaru Strait. Since the late 1980s, an undersea railway has transported passengers and goods between the two islands through the Seikan Tunnel. Hokkaido is located in northern Japan, and is separated from Japan’s largest island by a fairly narrow strait. The Sakhalin Island, which is a part of Russia, is just 43 km north of Hokkaido. 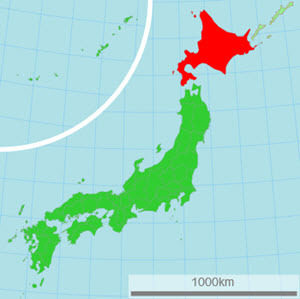 Japan, including Hokkaido, is located in a seismically active region. One of the more recent earthquakes that resulted in fatalities in Hokkaido occurred in 2018, when a 6.6 Mw earthquake struck on 6 September, with the epicentre near Tomakomai. 41 people were confirmed dead and around 680 were injured. The Hokkaido Prefecture is the coldest part of Japan, and temperatures on the eastern side of the main island are normally even lower than on the western side. Most of the main island is located within the humid continental climate zone and classified as hemiboreal, but the northernmost portion is classified as taiga biome. Both elevation and distance from the ocean have a major impact on local conditions. The average snowfall per season is for instance over 10 metres in some mountains adjacent to the Sea of Japan, while some other parts on Hokkaido Island receives less than 2 metres. Also, total precipitation for the mountains off the Sea of Japan is approximately 1,600 mm per annum, while parts of the interior lowlands and coastal lands along the Sea of Okhotsk get around 800 mm – which is very low for any place in Japan. The rivers in the Hokkaido Prefecture tend to freeze during the winter. Sea ports can be impacted by large floes of drift ice, especially by the Sea of Okhotsk. Hokkaido ports on the open Pacific Ocean and Sea of Japan tend to be open and operating year round, since the conditions are different there. Unlike Honshu, Hokkaido doesn’t really have a rainy season in June-July. Instead, the weather tends to be sunny and warm (not really hot), making it a popular destination for Honshu-residents looking to get away from the rains. In the winter time, visitors come to the Hokkaido mountain areas to enjoy winter sports, including powder snow skiing. In most years, you can expect substantial snowing to start in November, but most ski resorts wait until December to open for the season, which then lasts to April. This park was established in 1934, making it one of the oldest national parks in the prefecture. Examples of popular destinations within the park are Lake Mashu and Lake Kussharo, and the mountains Io, Mokoto, and Nishibetsu-dake. Just like Akan, this national park was established back in 1934. Covering an area of over 2,267 square kilometres, it is the largest national park in the whole country. You’ll find this park in the mountainous central region of Hokkaido, and the name Daisetsuzan actually means “great snowy mountains”. 16 mountains peaks in the park are more than 2,000 meters above sea level. Some of them have trails. The tallest peak is Asahidake at 2,290 meters. Established in 1949, this national park is named after the two volcanic caldera lakes Shikotsu and Toya in the western part of Hokkaido. The renowned hot spring resort Noboribetsu is found within this park. Shiretoko is a peninsula in north-eastern Hokkaido. In 1964, a national park was established here to safeguard it. In 2005, it became UNESCO World Natural Heritage Site. Examples of popular destinations within the park are Furepe Falls and the Shiretoko Pass. This area has been a national park since 1974. It’s named after the mountain Rishiri, the island Rebun and the Sarobetsu wetlands. Sarobetsu, a combination of coastal plain and low-laying moor in northwestern Hokkaido, is a designated Ramsar Site. This national park was established in 1987. Examples of popular destinations within the park are Lake Toro and the Hoso’oka Observatory.